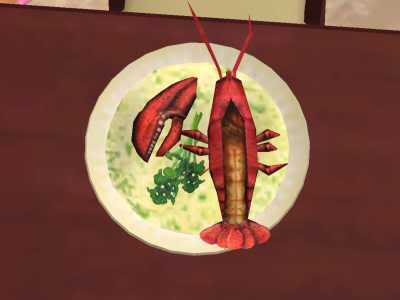 How many hours have you spent on The Sims boosting your cooking skills? Now you can do so at home! This Sims inspired Lobster Thermidor recipe is sure to be delicious and easy! 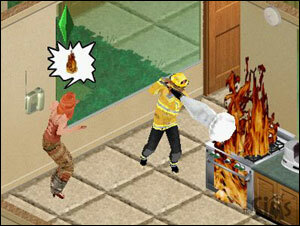 I love The Sims.. don't you? BTW please don't burn the house down..
Bring a pot of water to a boil, 3 or 4 inches deep. Add lobster tails to the water and boil 7 to 8 minutes. Drain and shock under cold water to cool. Use scissors to cut away soft underside of tails. Remove meat and save the shells, arranging them in a glass or ceramic baking dish. Chop the cooked lobster meat into chunks. Preheat your oven on BROIL in the HIGH setting. Heat a medium skillet and a small saucepan over medium heat. To the small saucepan, melt 2 tablespoons butter. Add finely chopped onion and cook 3 to 5 minutes until very soft. To the skillet, add remaining 2 tablespoons butter. When the butter melts, add chopped lobster meat and saute. Add flour to sauce pot with onions and cook together another 1 to 2 minutes. Whisk in wine, then milk. Remove Sauce from heat and stir in cheddar cheese and Old Bay seasoning. Pour sauce over lobster meat and stir to combine. Pour lobster into and over the shells in a glass baking dish and top with Parmesan and bread crumbs. Broil on high until golden, 2 or 3 minutes. Meanwhile heat the ready rice in the microwave per instructions on packaging. Remove the lobster from oven. Serve each tail, overflowing with the delicious saucy lobster meat, over a bed of rice pilaf.